Graphical facilities are an important and extremely versatile component of the R environment. It is possible to use the facilities to display a wide variety of statistical graphs and also to build entirely new types of graph. The graphics facilities can be used in both interactive and batch modes, but in most cases, interactive use is more productive. Interactive use is also easy because at startup time R initiates a graphics device driver which opens a special graphics window for the display of interactive graphics. Although this is done automatically, it may useful to know that the command used is X11() under UNIX, windows() under Windows and quartz() under macOS. A new device can always be opened by dev.new(). Once the device driver is running, R plotting commands can be used to produce a variety of graphical displays and to create entirely new kinds of display. High-level plotting functions create a new plot on the graphics device, possibly with axes, labels, titles and so on. Low-level plotting functions add more information to an existing plot, such as extra points, lines and labels. Interactive graphics functions allow you interactively add information to, or extract information from, an existing plot, using a pointing device such as a mouse. 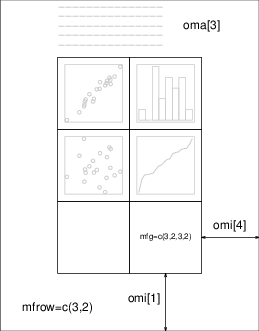 In addition, R maintains a list of graphical parameters which can be manipulated to customize your plots. This manual only describes what are known as ‘base’ graphics. A separate graphics sub-system in package grid coexists with base – it is more powerful but harder to use. There is a recommended package lattice which builds on grid and provides ways to produce multi-panel plots akin to those in the Trellis system in S.
High-level plotting functions are designed to generate a complete plot of the data passed as arguments to the function. Where appropriate, axes, labels and titles are automatically generated (unless you request otherwise.) High-level plotting commands always start a new plot, erasing the current plot if necessary. One of the most frequently used plotting functions in R is the plot() function. This is a generic function: the type of plot produced is dependent on the type or class of the first argument. If x and y are vectors, plot(x, y) produces a scatterplot of y against x. The same effect can be produced by supplying one argument (second form) as either a list containing two elements x and y or a two-column matrix. If x is a time series, this produces a time-series plot. If x is a numeric vector, it produces a plot of the values in the vector against their index in the vector. If x is a complex vector, it produces a plot of imaginary versus real parts of the vector elements. f is a factor object, y is a numeric vector. The first form generates a bar plot of f; the second form produces boxplots of y for each level of f.
df is a data frame, y is any object, expr is a list of object names separated by ‘+’ (e.g., a + b + c). The first two forms produce distributional plots of the variables in a data frame (first form) or of a number of named objects (second form). The third form plots y against every object named in expr. produces a pairwise scatterplot matrix of the variables defined by the columns of X, that is, every column of X is plotted against every other column of X and the resulting n(n-1) plots are arranged in a matrix with plot scales constant over the rows and columns of the matrix. which produces scatterplots of a against b for every joint conditioning interval of c and d.
The coplot() and pairs() function both take an argument panel= which can be used to customize the type of plot which appears in each panel. The default is points() to produce a scatterplot but by supplying some other low-level graphics function of two vectors x and y as the value of panel= you can produce any type of plot you wish. An example panel function useful for coplots is panel.smooth(). Distribution-comparison plots. The first form plots the numeric vector x against the expected Normal order scores (a normal scores plot) and the second adds a straight line to such a plot by drawing a line through the distribution and data quartiles. The third form plots the quantiles of x against those of y to compare their respective distributions. Produces a histogram of the numeric vector x. A sensible number of classes is usually chosen, but a recommendation can be given with the nclass= argument. Alternatively, the breakpoints can be specified exactly with the breaks= argument. If the probability=TRUE argument is given, the bars represent relative frequencies divided by bin width instead of counts. Constructs a dotchart of the data in x. In a dotchart the y-axis gives a labelling of the data in x and the x-axis gives its value. For example it allows easy visual selection of all data entries with values lying in specified ranges. Plots of three variables. The image plot draws a grid of rectangles using different colours to represent the value of z, the contour plot draws contour lines to represent the value of z, and the persp plot draws a 3D surface. Forces the function to act as a low-level graphics function, superimposing the plot on the current plot (some functions only). Suppresses generation of axes—useful for adding your own custom axes with the axis() function. The default, axes=TRUE, means include axes. Causes the x, y or both axes to be logarithmic. This will work for many, but not all, types of plot. Step-function plots. In the first form, the top of the vertical defines the point; in the second, the bottom. No plotting at all. However axes are still drawn (by default) and the coordinate system is set up according to the data. Ideal for creating plots with subsequent low-level graphics functions. Axis labels for the x and y axes. Use these arguments to change the default labels, usually the names of the objects used in the call to the high-level plotting function. Figure title, placed at the top of the plot in a large font. Sub-title, placed just below the x-axis in a smaller font. Sometimes the high-level plotting functions don’t produce exactly the kind of plot you desire. In this case, low-level plotting commands can be used to add extra information (such as points, lines or text) to the current plot. Add text to a plot at points given by x, y. Normally labels is an integer or character vector in which case labels[i] is plotted at point (x[i], y[i]). The default is 1:length(x). The graphics parameter type=“n” suppresses the points but sets up the axes, and the text() function supplies special characters, as specified by the character vector names for the points. Adds a line of slope b and intercept a to the current plot. h=y may be used to specify y-coordinates for the heights of horizontal lines to go across a plot, and v=x similarly for the x-coordinates for vertical lines. Also lm.obj may be list with a coefficients component of length 2 (such as the result of model-fitting functions,) which are taken as an intercept and slope, in that order. Draws a polygon defined by the ordered vertices in (x, y) and (optionally) shade it in with hatch lines, or fill it if the graphics device allows the filling of figures. Adds a title main to the top of the current plot in a large font and (optionally) a sub-title sub at the bottom in a smaller font. Adds an axis to the current plot on the side given by the first argument (1 to 4, counting clockwise from the bottom.) Other arguments control the positioning of the axis within or beside the plot, and tick positions and labels. Useful for adding custom axes after calling plot() with the axes=FALSE argument. Where x and y arguments are required, it is also sufficient to supply a single argument being a list with elements named x and y. Similarly a matrix with two columns is also valid input. In this way functions such as locator() (see below) may be used to specify positions on a plot interactively. Hershey fonts can produce better output, especially on a computer screen, for rotated and/or small text. Hershey fonts provide certain symbols that may not be available in the standard fonts. In particular, there are zodiac signs, cartographic symbols and astronomical symbols. Hershey fonts provide cyrillic and japanese (Kana and Kanji) characters. Waits for the user to select locations on the current plot using the left mouse button. This continues until n (default 512) points have been selected, or another mouse button is pressed. The type argument allows for plotting at the selected points and has the same effect as for high-level graphics commands; the default is no plotting. locator() returns the locations of the points selected as a list with two components x and y. Allow the user to highlight any of the points defined by x and y (using the left mouse button) by plotting the corresponding component of labels nearby (or the index number of the point if labels is absent). Returns the indices of the selected points when another button is pressed. The identify() functions performs no plotting itself, but simply allows the user to move the mouse pointer and click the left mouse button near a point. If there is a point near the mouse pointer it will be marked with its index number (that is, its position in the x/y vectors) plotted nearby. Alternatively, you could use some informative string (such as a case name) as a highlight by using the labels argument to identify(), or disable marking altogether with the plot = FALSE argument. When the process is terminated (see above), identify() returns the indices of the selected points; you can use these indices to extract the selected points from the original vectors x and y. A separate list of graphics parameters is maintained for each active device, and each device has a default set of parameters when initialized. Graphics parameters can be set in two ways: either permanently, affecting all graphics functions which access the current device; or temporarily, affecting only a single graphics function call. The par() function is used to access and modify the list of graphics parameters for the current graphics device. Without arguments, returns a list of all graphics parameters and their values for the current device. With named arguments (or a single list argument), sets the values of the named graphics parameters, and returns the original values of the parameters as a list. Setting graphics parameters with the par() function changes the value of the parameters permanently, in the sense that all future calls to graphics functions (on the current device) will be affected by the new value. You can think of setting graphics parameters in this way as setting “default” values for the parameters, which will be used by all graphics functions unless an alternative value is given. Note that calls to par() always affect the global values of graphics parameters, even when par() is called from within a function. This is often undesirable behavior—usually we want to set some graphics parameters, do some plotting, and then restore the original values so as not to affect the user’s R session. You can restore the initial values by saving the result of par() when making changes, and restoring the initial values when plotting is complete. produces a scatterplot using a plus sign as the plotting character, without changing the default plotting character for future plots. Unfortunately, this is not implemented entirely consistently and it is sometimes necessary to set and reset graphics parameters using par(). The following sections detail many of the commonly-used graphical parameters. The R help documentation for the par() function provides a more concise summary; this is provided as a somewhat more detailed alternative. A description of the parameter’s effect. name is the name of the parameter, that is, the argument name to use in calls to par() or a graphics function. value is a typical value you might use when setting the parameter. Note that axes is not a graphics parameter but an argument to a few plot methods: see xaxt and yaxt. Character to be used for plotting points. The default varies with graphics drivers, but it is usually a circle. 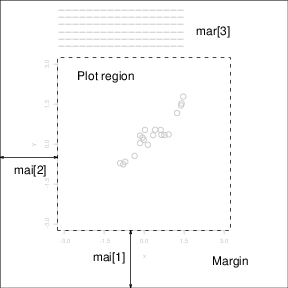 Plotted points tend to appear slightly above or below the appropriate position unless you use “.” as the plotting character, which produces centered points. Those from 21 to 25 may appear to duplicate earlier symbols, but can be coloured in different ways: see the help on points and its examples. In addition, pch can be a character or a number in the range 32:255 representing a character in the current font. Line types. Alternative line styles are not supported on all graphics devices (and vary on those that do) but line type 1 is always a solid line, line type 0 is always invisible, and line types 2 and onwards are dotted or dashed lines, or some combination of both. Line widths. Desired width of lines, in multiples of the “standard” line width. Affects axis lines as well as lines drawn with lines(), etc. Not all devices support this, and some have restrictions on the widths that can be used. Colors to be used for points, lines, text, filled regions and images. A number from the current palette (see ?palette) or a named colour. The color to be used for axis annotation, x and y labels, main and sub-titles, respectively. An integer which specifies which font to use for text. If possible, device drivers arrange so that 1 corresponds to plain text, 2 to bold face, 3 to italic, 4 to bold italic and 5 to a symbol font (which include Greek letters). The font to be used for axis annotation, x and y labels, main and sub-titles, respectively. Justification of text relative to the plotting position. 0 means left justify, 1 means right justify and 0.5 means to center horizontally about the plotting position. The actual value is the proportion of text that appears to the left of the plotting position, so a value of -0.1 leaves a gap of 10% of the text width between the text and the plotting position. Character expansion. The value is the desired size of text characters (including plotting characters) relative to the default text size. The character expansion to be used for axis annotation, x and y labels, main and sub-titles, respectively. Many of R’s high-level plots have axes, and you can construct axes yourself with the low-level axis() graphics function. Axes have three main components: the axis line (line style controlled by the lty graphics parameter), the tick marks (which mark off unit divisions along the axis line) and the tick labels (which mark the units.) These components can be customized with the following graphics parameters. The first two numbers are the desired number of tick intervals on the x and y axes respectively. The third number is the desired length of axis labels, in characters (including the decimal point.) Choosing a too-small value for this parameter may result in all tick labels being rounded to the same number! Orientation of axis labels. 0 means always parallel to axis, 1 means always horizontal, and 2 means always perpendicular to the axis. Positions of axis components. The first component is the distance from the axis label to the axis position, in text lines. The second component is the distance to the tick labels, and the final component is the distance from the axis position to the axis line (usually zero). Positive numbers measure outside the plot region, negative numbers inside. Length of tick marks, as a fraction of the size of the plotting region. When tck is small (less than 0.5) the tick marks on the x and y axes are forced to be the same size. A value of 1 gives grid lines. Negative values give tick marks outside the plotting region. Use tck=0.01 and mgp=c(1,-1.5,0) for internal tick marks. A single plot in R is known as a figure and comprises a plot region surrounded by margins (possibly containing axis labels, titles, etc.) and (usually) bounded by the axes themselves. Widths of the bottom, left, top and right margins, respectively, measured in inches. Similar to mai, except the measurement unit is text lines. mar and mai are equivalent in the sense that setting one changes the value of the other. The default values chosen for this parameter are often too large; the right-hand margin is rarely needed, and neither is the top margin if no title is being used. The bottom and left margins must be large enough to accommodate the axis and tick labels. Furthermore, the default is chosen without regard to the size of the device surface: for example, using the postscript() driver with the height=4 argument will result in a plot which is about 50% margin unless mar or mai are set explicitly. When multiple figures are in use (see below) the margins are reduced, however this may not be enough when many figures share the same page. R allows you to create an n by m array of figures on a single page. Each figure has its own margins, and the array of figures is optionally surrounded by an outer margin, as shown in the following figure. Set the size of a multiple figure array. The first value is the number of rows; the second is the number of columns. The only difference between these two parameters is that setting mfcol causes figures to be filled by column; mfrow fills by rows. The layout in the Figure could have been created by setting mfrow=c(3,2); the figure shows the page after four plots have been drawn. Setting either of these can reduce the base size of symbols and text (controlled by par(“cex”) and the pointsize of the device). In a layout with exactly two rows and columns the base size is reduced by a factor of 0.83: if there are three or more of either rows or columns, the reduction factor is 0.66. Position of the current figure in a multiple figure environment. The first two numbers are the row and column of the current figure; the last two are the number of rows and columns in the multiple figure array. Set this parameter to jump between figures in the array. You can even use different values for the last two numbers than the true values for unequally-sized figures on the same page. Position of the current figure on the page. Values are the positions of the left, right, bottom and top edges respectively, as a percentage of the page measured from the bottom left corner. The example value would be for a figure in the bottom right of the page. Set this parameter for arbitrary positioning of figures within a page. If you want to add a figure to a current page, use new=TRUE as well (unlike S). Size of outer margins. Like mar and mai, the first measures in text lines and the second in inches, starting with the bottom margin and working clockwise. Outer margins are particularly useful for page-wise titles, etc. Text can be added to the outer margins with the mtext() function with argument outer=TRUE. There are no outer margins by default, however, so you must create them explicitly using oma or omi. More complicated arrangements of multiple figures can be produced by the split.screen() and layout() functions, as well as by the grid and lattice packages. R can generate graphics (of varying levels of quality) on almost any type of display or printing device. Before this can begin, however, R needs to be informed what type of device it is dealing with. This is done by starting a device driver. The purpose of a device driver is to convert graphical instructions from R (“draw a line,” for example) into a form that the particular device can understand. For printing on PostScript printers, or creating PostScript graphics files. Produces a PDF file, which can also be included into PDF files. will produce a file containing PostScript code for a figure five inches high, perhaps for inclusion in a document. It is important to note that if the file named in the command already exists, it will be overwritten. This is the case even if the file was only created earlier in the same R session. In advanced use of R it is often useful to have several graphics devices in use at the same time. Of course only one graphics device can accept graphics commands at any one time, and this is known as the current device. When multiple devices are open, they form a numbered sequence with names giving the kind of device at any position. Each new call to a device driver function opens a new graphics device, thus extending by one the device list. This device becomes the current device, to which graphics output will be sent. Returns the number and name of all active devices. The device at position 1 on the list is always the null device which does not accept graphics commands at all. Returns the number and name of the graphics device next to, or previous to the current device, respectively. Can be used to change the current graphics device to the one at position k of the device list. Returns the number and label of the device. Terminate the graphics device at point k of the device list. For some devices, such as postscript devices, this will either print the file immediately or correctly complete the file for later printing, depending on how the device was initiated. Make a copy of the device k. Here device is a device function, such as postscript, with extra arguments, if needed, specified by ‘…’. dev.print is similar, but the copied device is immediately closed, so that end actions, such as printing hardcopies, are immediately performed. Terminate all graphics devices on the list, except the null device. and these can be accessed from R via the package rggobi, described at http://www.ggobi.org/rggobi. Also, package rgl provides ways to interact with 3D plots, for example of surfaces.